Sub: Promotion from GP Rs.1800 (Level-1) to GP Rs.1900 (Level-2) against 16-2/3% quota – Minimum eligibility Condition of service for selection. 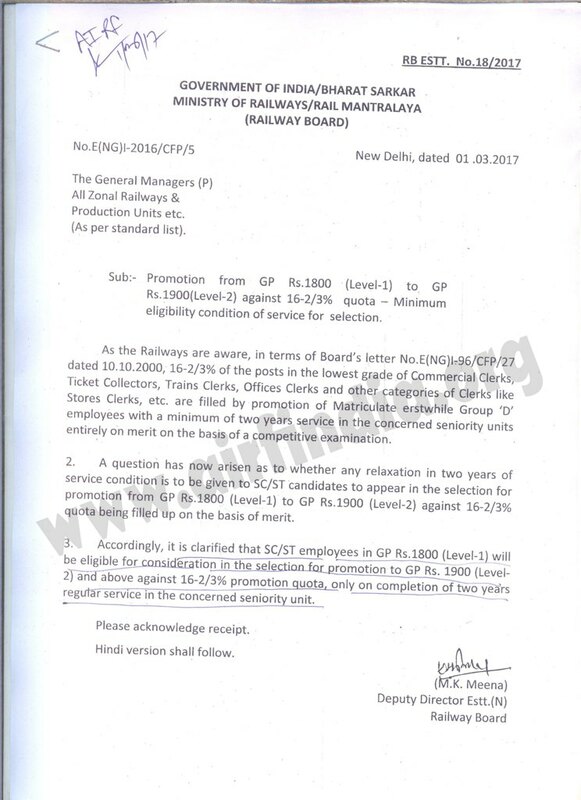 As the Railways are aware, in terms of Board’s letter No.E(NG)1-96/CFP/27 dated 10.10.2000, 16-2/3% of the Posts in the lowest grade of Commercial Clerks, Ticket Collectors, Trains Clerks, Offices Clerks and other categories of Clerks like stores clerks, etc. are filled by promotion of Matriculate erstwhile Group ‘D’ employees with a minimum of two years service in the concerned seniority units entirely on merit on the basis of a competitive examination. 2. A question has now arisen as to whether any relaxation in two years of service condition is to be given to SC/ST candidates to appear in the selection for promotion from GP Rs.1800 (Level-1) to GP Rs.1900 (Level-2) against 16-2/3% quota being filled up on the basis of merit. 3. Accordingly, it is clarified that SC/ST employees in GP Rs.1800 (Level-1) will be eligible for consideration in the selection for promotion to GP Rs.1900 (Level-2) and above against 16-2/3% promotion quota, only on completion of two years regular service in the concerned seniority unit.